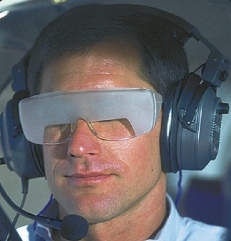 An Example Of Foggles. No, That’s Not Me. I was back in the real airplane today for the first time since November 14, thanks to a pattern of high winds that led to three cancelled flight lessons. But today was great for learning, with slight turbulence and crosswinds of about seven knots. The curriculum for today was to take off, climb to 2,500 feet, and then track the Modena VOR 350 radial like we were going somewhere. Then it was time for “hood work,” which means flying wearing Foggles, which are glasses that make it so you can only see the instruments and not outside the airplane (also called working “under the hood”). The plan was to practice some turns and climbs, slow flight, and a power-off stall under the hood, and then practice unusual attitude recoveries. To do the latter the CFI had me fly with my eyes closed until the plane was too far nose up, nose down, or banked, at which point he’d tell me to open my eyes, look at the instruments, and correct. Then we did more extreme attitude recoveries, in which the CFI took the controls and had me close my eyes and put my head down, at which point he got us into extreme banks, always with either a nose-up or nose-down attitude, at which point he’d tell me to open my eyes, look at the instruments, and correct. Then we simulated what I’d do if I’d flown into instrument conditions as a low-hour pilot (and while still under the hood). First step was to call ATC to ask for advisories and vectors back to the field (and out of the imagined clouds). The instructor played ATC in this case, with me making the calls and him giving the directions. We managed to get back to the Modena VOR, which is about five miles from the home field, but not before I made the mistake of “reverse sensing,” meaning I was tracking the needle “OUT” rather than “IN,” which meant I kept flying away from rather than to the desired radial. This made the instructor very happy, as he did not need to artificially explain this navigation mistake. I was happy to have helped him out. Once we were at Modena I took off the Foggles and we entered the pattern for a crosswind landing (which went very well). All in all it was excellent practice. The air was a bit turbulent, with up and down drafts testing my ability to keep a level altitude under the hood. I felt like I was working and learning the entire time, and I could tell it had been a while since the last lesson, but all the stuff that is supposed to be comfortable by this point (takeoff, slow flight, stall recovery, flying the pattern, radio work) was, and the crosswind landing was very solid. I was pleased, and I’m eager for the next lesson (set for next week, but with possible weather intervening). Here is the CloudAhoy map of the flight. Follow this link to see the route and replay it if you’re interested in doing so.